Fence privacy screening to keep outdoor areas more private. Often used by constructions sites, tennis courts, sports fields, festivals and events. How high am I allowed to erect a privacy screen on my own land in the UK? Without planning permission you are allowed to erect a fence standing at a maximum of 2m high. The one exception to this rule is where your property border adjoins a road or footpath. In this case, you can erect a fence 3m high. For more information visit the governments planning portal website. Can people on the outside see thru it? If you have selected 95% privacy mesh then 95% of the visibility will be removed. This leaves only 5% visibility remaining which is very limited. Does the material put wear and tear on your fence? No, the material is light and cloth-like. It will not cause any deterioration effect on your fence. How flexible is the material? It is very flexible and light and almost cloth like. It can be easily rolled up and stored away. 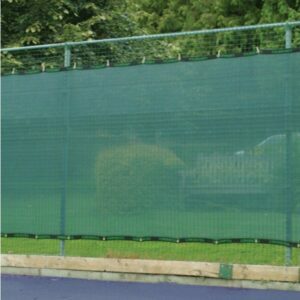 It is also very easy to cut, commonly used as tennis privacy screen.